I’ve been pretty excited about trying Abyssinia ever since I heard that an Ethiopian restaurant opened on Wickenden Street in Providence, RI because I love berbere and zigni spices. It wasn’t until a friend of mine recommended that we meet there for dinner that I finally got to try the restaurant. A little research revealed that the owner of Abyssinia, Ben Thorp, is a born and raised American. Aside from simply making Ethiopian and Eritrean food, he employs Ethiopian or Eritrean refugees as employees in his restaurant. This is a really great idea, which probably helps out many people looking to make a better life for themselves in America. At the end of the day, however, the success or failure of the restaurant also hinges on service and food quality. The interior of Abyssinia is a bit cramped due to the strange layout of the restaurant. The inside is a converted house, but that is relatively common on Wickendon Street. The decor consists of somewhat randomly placed Ethiopian/Eritrean pictures or paintings of various cultural figures. 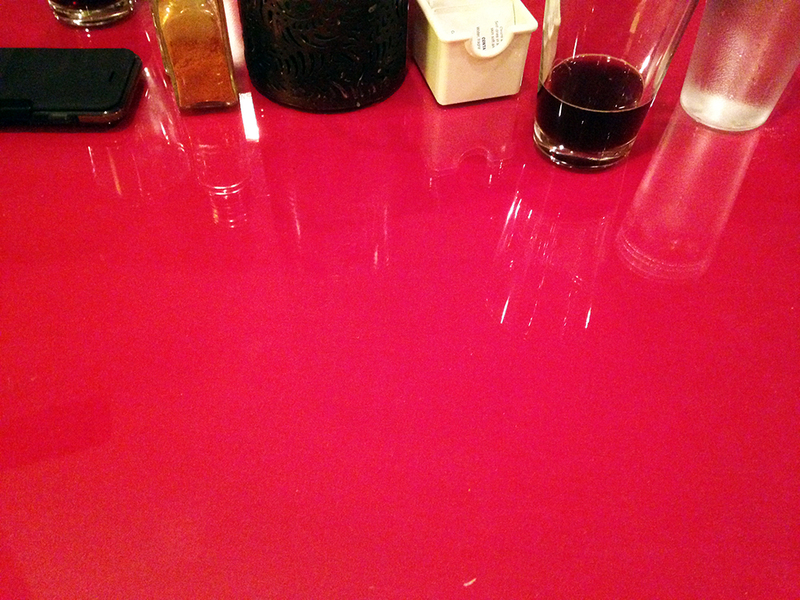 The tables are a bright red, which is something you will get familiar with as you stare down at the empty place setting for very long periods of time before receiving any food. The service at Abyssinia is abysmal. That phrasing may hint at a crude play on words, but there is nothing playful about waiting for someone to even acknowledge your presence after being seated. It took my very hungry friend and me 45 minutes to receive our very simple appetizer. Allegedly, Abyssinia serves popcorn of some kind before meals and we saw a couple of other random tables receive some, but no one ever offered us any, so we thought that maybe people had to order it. No one checked on us while we waited and other than delivering our food in a dismissive way in between outrageously long periods of time, we were essentially neglected despite sitting right in front of the owner himself for 2.5 long hours. In general, the food was decent. While it is a very different dining experience than the usual American or common Ethnic-American staples, “different” isn’t enough all by itself. Sambussas – We started by ordering the vegetarian sambussas. 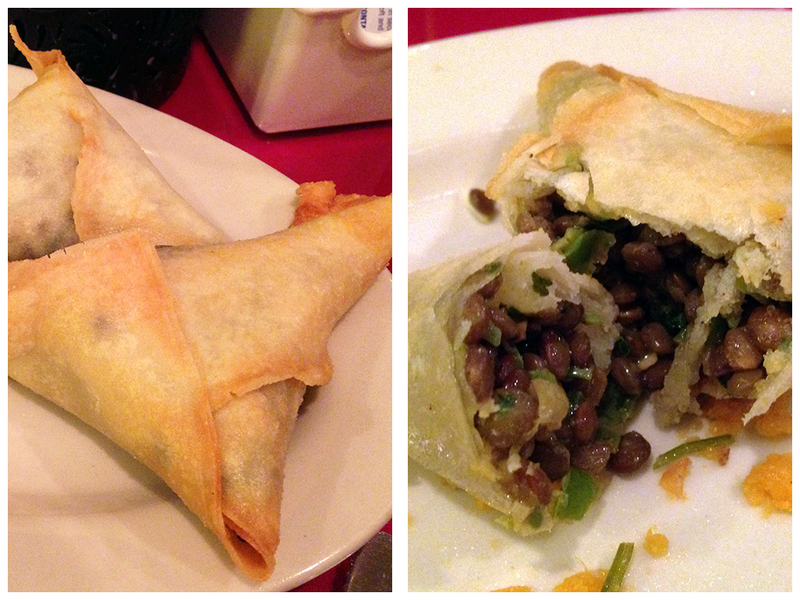 These are basically lentils with spices wrapped in pastry dough and fried. It sounded a lot like an Indian samosa, so we were pretty excited. What came out instead was a triangular, greasy disaster. The lentils inside were severely under-spiced (but this is an Ethiopian/Eritrean restaurant!) as well as undercooked. They were also just leaking grease everywhere. Sikwar Dinich Tibs (Sweet Potato Cakes) – Let me start by saying that I don’t especially care for sweet potatoes, so I humored my friend when he wanted to order these. Nonetheless, I will admit that the flavors worked in this dish. 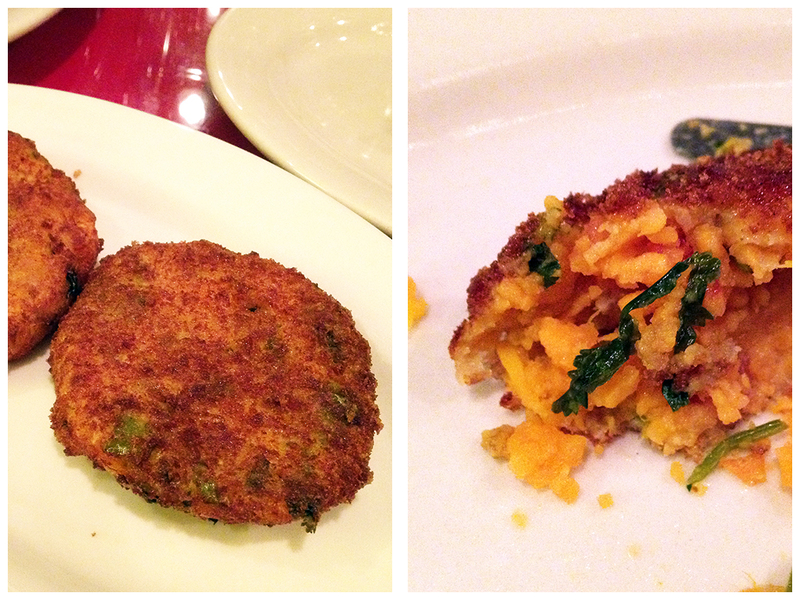 If you enjoy sweet potatoes, then you’ll probably like the sweet potato cakes even more than I did. They were unfortunately served to us lukewarm instead of hot from the fryer, but the cilantro and other spices tasted pretty good. 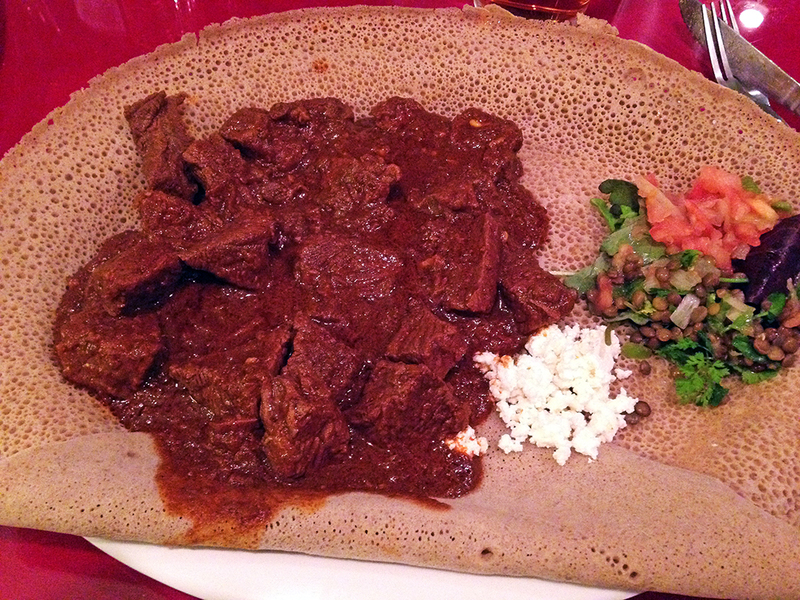 Key Wot – I ordered the Key Wot, which is cubes of beef in berbere spices served over injera (spongy flatbread). I’ve had this dish before, but with chicken and prepared in Sudan. While Sudan isn’t Ethiopia, it is a lot closer to Ethiopia than Providence, RI. The beef itself was cooked well and the spices were balanced so that they were spicy, but not overpowering. The injera bread acted like a playful plate on a plate, but quickly lost its structural integrity after a few seconds of exposure to any kind of liquid. That meant you needed to rip off a piece, grab the meat, and eat quickly before your fingers plunged through the bread. Overall, this was a decent dish. My friend ordered the bone-in chicken version, which is considered the house specialty, but he didn’t enjoy it very much. 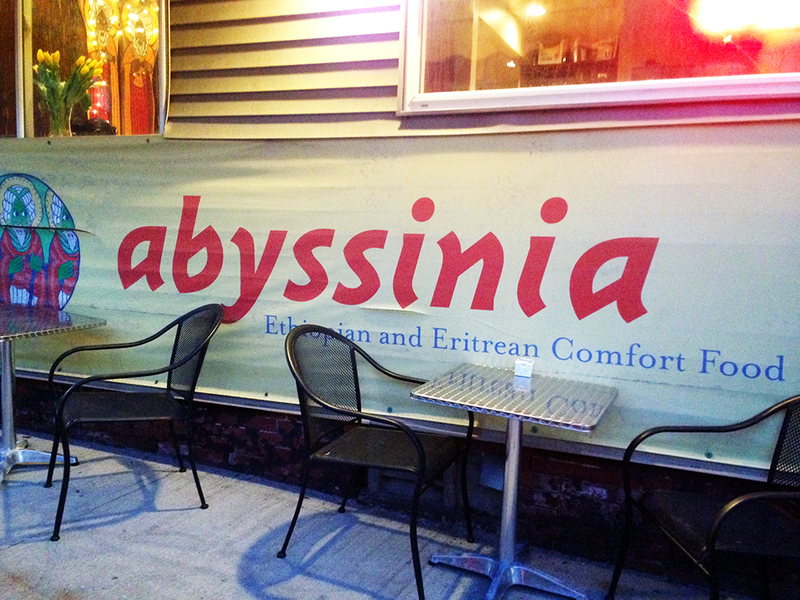 The service is terrible and the food is mostly good, but not worth price or the ordeal of dining at Abyssinia. The American owner’s goals of helping out Ethiopian refugees and immigrants by hiring them is truly laudable, but the overall result of the restaurant’s quality falls very short. I’m very confused by the good reviews and recommendations online for this restaurant, but the explanation is probably just the fact that Abyssinia is basically the only game in town for authentic Ethiopian food. I was so excited when I read the heading of this post thinking that finally my dream came true fining an authentic Ethiopian restaurant but all my hopes evaporated when I read on. If I ever visit this restaurant, it would be to buy some of this flat bread take out and I eat it my way. Sorry to get your hopes up! Like I said, the food is ok, but its the service that gets you. Then again, people are raving about the place, so it’s possible I went on a very very off night.